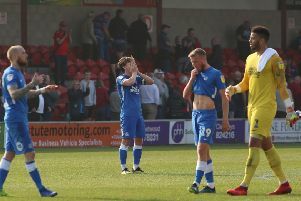 POSH VERDICTS: A strong team effort and three brilliant goals won the game for Peterborough United. Jack Baldwin celebrates a brilliant Posh win at Sheffield United. Photo: Joe Dent/theposh.com. Peterborough United delivered an outstanding team display in toppling Sheffield United 3-2 at Bramall Lane today (January 2). The team effort was probably more impressive than the individual displays, although Posh did score three high-quality goals. Erhun Oztumer (seated) celebrates his goal for Posh at Sheffield United. Photo: Joe Dent/theposh.com. Here are the Peterborough Telegraph player marks.